JRDN Restaurant at Tower23 Hotel has announced the hiring of new chef de cuisine, Ami Cisneros. 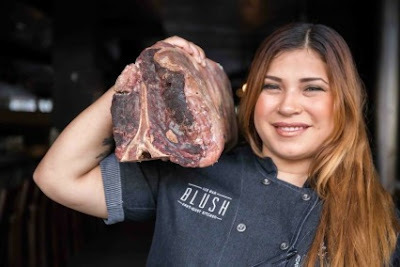 A 2010 graduate of San Diego Culinary Institute and a native San Diegan, Ami brings vast experience to the position having worked in some of San Diego’s finest kitchens, including Blush Ice Bar + East and West Kitchen, Mister A's, and Alchemy. “Ami is a welcome addition to JRDN. Her culinary know-how coupled with a genuine enthusiasm for creating exceptional dining experiences is a great complement to our exceptional kitchen team,” explains Executive Chef DJ Tangalin. Since graduating from San Diego Culinary Institute, Chef Ami has been working in San Diego kitchens learning from some of the city’s most respected chefs. At Alchemy, under the guidance of World Food Champion Chef Ricardo Heredia, Cisneros learned to hone her culinary skill set before making her way around local kitchens continuing to broaden her knowledge of modern gastronomy and kitchen management. Chef Ami most recently worked under the leadership of mentor and Executive Chef Daniel Barron at Blush Ice Bar before both chefs departed last November. "My career has taken me on many great paths in this city that have connected me to some amazing chefs and people," commented Chef Ami. "I'm very excited to start this culinary journey with Chef DJ and his dedicated team on and off the line. " In addition to her education and experience, Chef Ami has been active in the San Diego culinary community competing in food-centric fundraising events, such as Front Burner Fund Taco Throwdown.